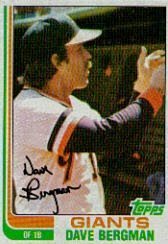 Dave Bergman’s death at age 61 may maintain a hobby mystery. The famed 1984 Detroit Tigers role player continued his devotion to youth baseball until the end. Anyone who met him in the Detroit area seemed charmed by his enthusiasm and sincerity. His feelings about autographs weren’t so clear. Check the fascinating www.sportscollectors.net for insights about Bergman’s differing signing habits. He was charging for autographs by mail as early as 2010, ending with a $7 per fee. Previously, he tried to maintain a limit of one autograph per fan letter. Other cards would be returned unsigned, if at all. And, years ago, I saw him express to a reporter that he didn’t want to answer any questions by mail. The moral of this story? So many collectors pursue stars first. Don’t assume that only the top names in the game will become tougher signers in later years.